Reactis® V2017.2 is now available for download. The new version of Reactis Tester generates test suites with fewer tests and steps while achieving the same level of coverage. A new feature lets you specify different input constraints for different simulation times. V2017.2 also adds support for Simulink® R2017b and includes enhancements to scopes, test execution reports, and the API. Reactis has always included a facility to assign constraints (for example a range) to top-level inputs. If an input has a constraint, then Reactis Tester will only generate values for the input that adhere to the constraint, for example are within a specified range. V2017.2 extends this concept to let you specify different constraints for different simulation times. This enables you specify that an input has a specific initial value or that an input holds its value constant for some duration. 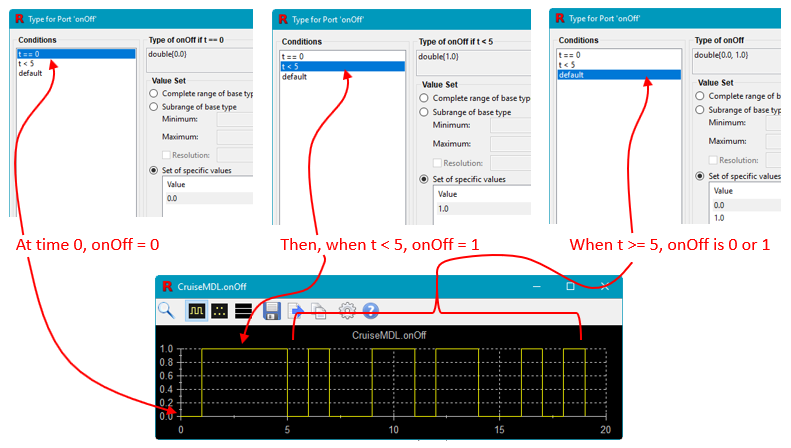 For example, the screenshots below show how conditional input constraints specify that input onOff initially has value zero, then holds the value one until time five, and subsequently is randomly assigned the value zero or one. 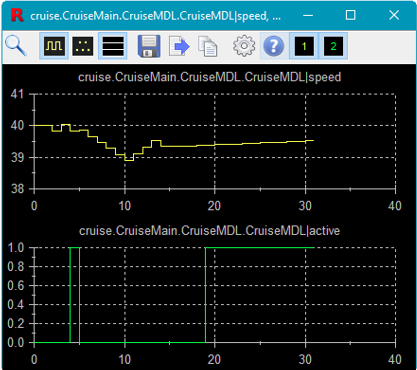 Each signal in a scope can now have its own y-axis as shown below. Also, V2017.2 lets you save a scope as a signal group to store a collection of signals along with settings for displaying them. The signal group can subsequently be re-opened in a scope in future Reactis sessions. When generating a test execution report, Reactis now gives you the option to include a section that lists all targets covered by a step in a test. For example, in the report to the right, step 46 of test 8 covers an MC/DC target, a Decision target, and a Condition target. Each of the three targets is located in the DeactivateActivate Stateflow® diagram. 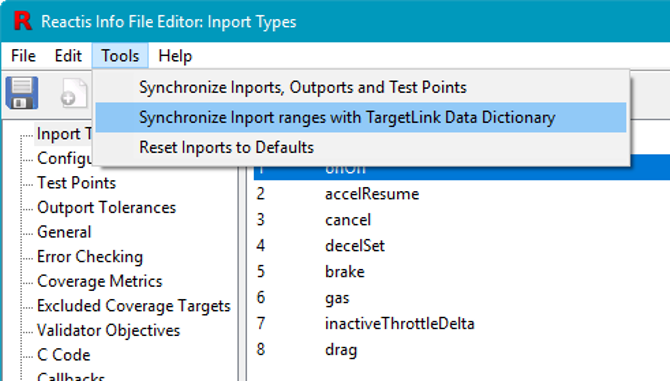 You can now import top-level inport ranges from the TargetLink Data Dictionary. A variable in the watched variable panel is highlighted when its value changes. 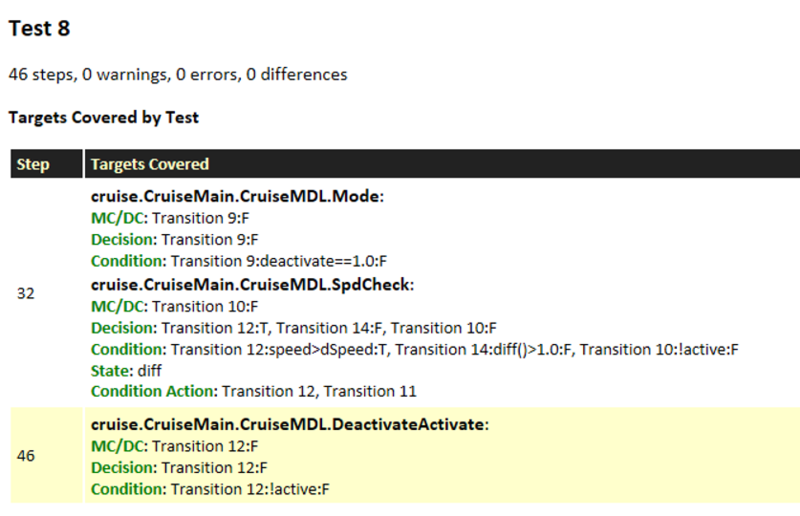 Coverage tracking can now be disabled for all targets within Validator Diagram Objectives. The objective itself (an assertion or UDT) is still tracked. A new option allows you to exclude the equal case when tracking relational operator boundary coverage. This is most useful if the inputs to the Relational Operator block are floating point values. Reactis now draws the relational operator and constant on Compare To Constant blocks. Reactis is a registered trademark of Reactive Systems, Inc. MATLAB, Simulink, and Stateflow are registered trademarks of The MathWorks. TargetLink is a registered trademark of dSPACE, GmbH.